The 18th birthday party – it's a big one! The final transition into adulthood, and a chance for a joyous celebration. I stupidly organised my own 18th birthday party, and must admit I had no clue on what I was doing! Now I'm older and wiser, I know what needs to be done, so I thought I'd share them here with you! 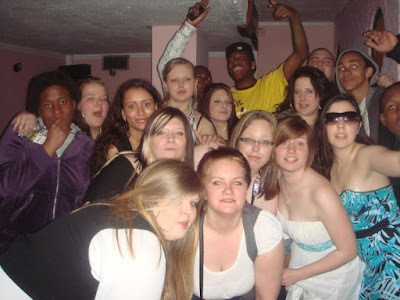 Me (second row in the middle with glasses) and some of my guest at my 18th birthday party. The most important part of your checklist is having an initial conversation with your son or daughter to make sure you don't cause them any embarrassment with your efforts. There are two major questions to answer here: scale and alcohol. To start with, you have to talk to your son or daughter about what they actually want; for some teens, a giant party with a huge host of friends invited is a nightmare, for others it’s the only way to celebrate a milestone like this. The alcohol question is tricky because it’s more than likely your son or daughter will want to celebrate with a drink. In the UK it's not illegal for teenagers under 18 to drink on private premises, but you'd do well to consult with the parents of any guests under 18. Once you've got an idea of the scale of your party, lock down exactly what you want to spend. Setting a firm budget ensures you won’t get carried away with planning your celebrations. Some teenagers would love a theme, some of them would sooner the earth swallow them up than have a theme. This one definitely harks back to pre-planning, you need to know whether or not it would be a perfect idea. Get the venue sorted early, it's going to be a huge part of your budget. You could book a hotel, a restaurant, or a pub function room, but don't look past the simple back garden marquee. You can create the ideal venue in your back garden with near unlimited customisation options regardless of your scale, check out marqueesandevents.com for some truly unique marquees and tipis. Who do you want there? With the help of your teenager, you need to work up a list of guests which works for your budget and your agreed venue. Get them made if you want to go with a physical invite, and get them out early. You need numbers as soon as possible, so insist on a RSVP. You also need to make sure you specify whether or not it's appropriate to bring a plus one to the party. You can buy invitations online, or from a stationary shop if you don’t mind hand-writing them all. For some people, all the entertainment they need is the company of their friends, but it can be prudent to organise something if your budget permits it. Things like party games might make your guests cringe, but consider a DJ or even a cover band to liven up the evening. Don't go nuts, your guests are coming for a celebration, not a dinner party (unless you've been specifically asked to plan an actual dinner party). Consider inviting a food truck to stop by the party instead of stressing yourself out over arranging food, the novelty will be priceless and if you're serving alcohol it will be gratefully received. If you don’t fancy throwing a party, there are still a whole range of ways to celebrate an 18th. Take a look at the Virgin Experience site for some good examples. Have I missed something vital? Please do let me know in a comment!